If you’re a portrait or wedding photographer, you know that building a successful photography business is much harder than you first imagined. The Internet looks like the perfect place to get your name out there to market your photography, but most photographers have a really tough time getting clients—certainly not enough to make a dependable living from their camera. The worst part is you’re great at what you do and you produce amazing photographs for your clients every single time. Your website looks nice and it’s easy for people to see your work through your slideshows and galleries. As far as you know, you’ve done everything right. Potential clients say how much they like your work, but getting them to book you is incredibly difficult for some reason. Your website and amazing images sit there with the promise of booking new clients, but nothing happens. If that sounds like your situation, this book is for you. 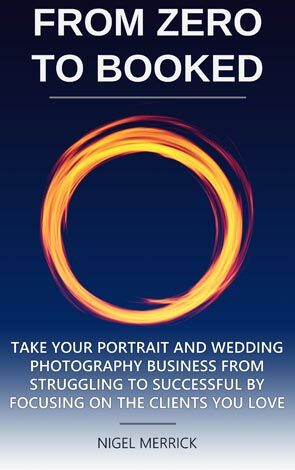 In “Zero To Booked” I show you exactly why business is so tough right now for most portrait and wedding photographers, and what you must do instead to market yourself and your amazing work to grow your business. This book was written for photographers of all levels who want to build a family of happy clients who love what they do. It’s for people like you who want to grow and build a loyal clientele instead of wasting time wondering where the next client will come from. As a photography marketing coach, I’ve helped hundreds of professional photographers over the last 10 years. The tips and strategies in this book are distilled from thousands of hours of hands-on experience, brought together in one convenient place for the first time. If you’re tired of watching the same old “normal” marketing and sales strategies fail day after day, you’ll be thrilled to discover an entirely new, but simple, way to reach more of your ideal clients and turn them into leads and customers. “Zero To Booked” is available from Amazon as a Kindle eBook, which you can read on your Kindle device, smartphone, tablet, or computer.